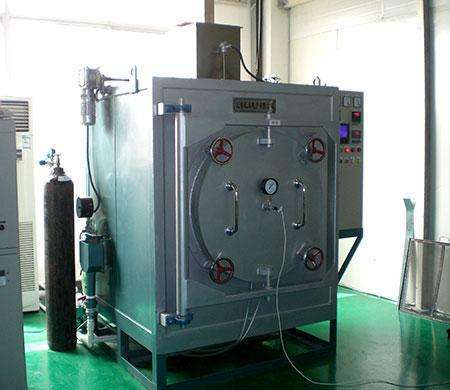 Vacuum furnace is one of the main equipment in the heat treatment industry, the processing of product quality is reliable, not only need to have three wastes treatment and environmental protection no pollution, no, at the same time, significantly lower than the traditional heat treatment equipment such as salt bath furnace energy consumption; Therefore, it is widely used in aerospace, weapons, electronics, automobile, machinery industry and other fields. Brass heat treatment system: the main heat treatment of brass is annealing; These include recrystallization annealing and stress annealing. The recrystallization annealing includes the intermediate annealing and the final annealing of the product, with the aim of eliminating the hardening, restoring plasticity and obtaining fine grain structure. The recrystallization temperature of brass and the alloy composition and content of impurities, mostly from 300 ~ 400 ℃. Recrystallization annealing at 600 ~ 700 ℃. More to stress annealing temperature 230 ~ 350 ℃ in more.